The story of Big Star – a band once so obscure, only critics, musicians and a small handful of in-the-know fans even knew of their brief existence – has now passed into popular culture. In recent years, the Memphis group’s music has been championed by prominent musicians (among them Chris Stamey of The dB’s and R.E.M.‘s Mike Mills). Their two Stax/Ardent albums (#1 Record and Radio City) have been reissued multiple times (the most recent, just this summer, with contemporary liner notes from Mills). A 4CD box set of rarities, Keep An Eye on the Sky came out in 2009 to widespread acclaim. 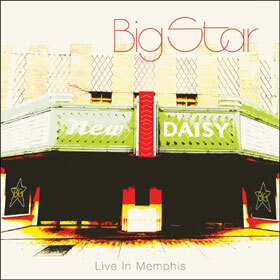 And Big Star got a proper, feature-length documentary done on them with 2012’s Nothing Can Hurt Me. But all of this modern-day, well-earned appreciation was actually preceded by activity from Alex Chilton, vocalist/guitarist with Big Star through its original existence. Though the famously prickly Chilton had previously shown little interest in revisiting his Big Star years (much of his subsequent solo output seemed, at times, to be a repudiation of the musical approaches of both Big Star and his teenage group, The Box Tops), in April 1993 he surprised everyone by agreeing to a one-off reunion of the original band. So it was that this foursome practiced up a set of Big Star tunes (plus some solo material from Big Star’s late and departed founder, guitarist Chris Bell) and did the “one-off” show. But the story didn’t quite end there, however: the reformed Big Star went on to do a number of high-profile TV and concert dates. That run was set to conclude with a date back in the band’s Memphis hometown, scheduled for October 29, 1994.